Living... with Naota Nandaba, a hapless schoolboy she runs over with her Vespa. Haruko's not particularly sorry about it. "Oh, I killed him," she says, looking down at Naota's body. "I finally find the S.O.B. and I killed him. I didn’t mean to, it was an accident, kind of." Naota survives, though, and since he's so fun to mess with, Haruko decides to move in with him. Visiting... Earth. By her own account, Haruko is an alien from the Space Patrol who's just decided to drop in on Earth. But even discounting the alien part, there are hints that there's more to the pink-haired biker than meets the eye. Profession... housekeeper for Naota, to his great displeasure. Other than that, she claims to be a First Class Officer for the Space Patrol. But given her attitude toward lying – "Yeah," Haruko says, shrugging, "I lied; so what" – it's doubtful how true her claims are. Interests... running people over with her Vespa, harassing preteens, and hitting people over the head with her chainsaw-guitar. Naturally, Naota is the lucky recipient of all three. Relationship Status... single. Haruko might be merciless in teasing Naota, but this isn’t likely the start of one of those love-hate romances. After all, Naota is only 12. Challenge... who knows? Naota would say it's to make his life hell, but Haruko's clearly on Earth for a larger reason than irritating apathetic 12-year-olds. Personality... brash, cool, and more than just a little strange. Fast-talking, fast-driving, and as cheerful as she is callous, Haruko seems to tick off boxes for several major personality disorders. Spontaneous, energetic, and more capricious than a LCD-induced hallucination, Haruko may have an oddball charm, but that doesn't mean she's not capable of doing some serious harm. As she puts it, "I don't care what happens to this planet. They'll have to learn to 'think smooth,' I guess!" Haruko Haruhara's popularity ranking on CharacTour is #631 out of 5,000+ characters. See our top-ranked characters and read their profiles. FLCL is an original video animation series written by Yōji Enokido, directed by Kazuya Tsurumaki and produced by the FLCL Production Committee, which included Gainax, Production I.G, and Starchild Records. 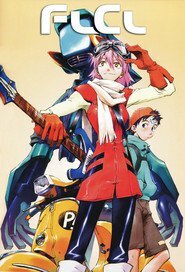 FLCL follows Naota Nandaba, a twelve-year-old boy living in the fictional Japanese suburb of Mabase, and his interactions with Haruko Haruhara, who arrives in the quiet suburb, drawn by the industrial town houses and the Medical Mechanica building. The English adaptation of the series was first licensed by Synch-Point which released the DVDs and soundtrack, but these went out of print in 2006. In January 2010, Funimation Entertainment announced that they would be re-releasing the series on DVD and releasing it for the first time on Blu-ray. The series aired in America on Cartoon Network's Adult Swim several times and is now set to air on the channel's Toonami block from October 26th, 2013, and aired in Canada on G4techTV Canada's Anime Current block. The series is also available via Hulu, iTunes, and on FUNimation's website.